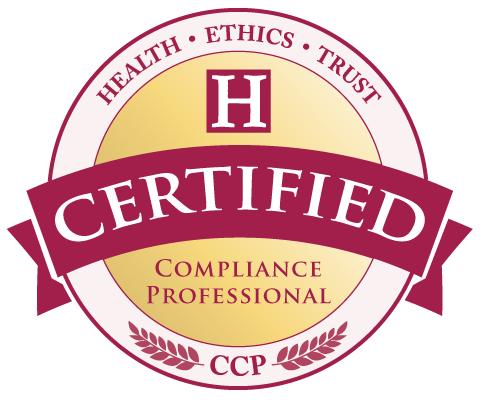 Certified Compliance Professional (CCP) is a certification process for healthcare compliance professionals that is offered by the Health Ethics Trust. The Trust began the process of establishing a professional healthcare compliance certification shortly after the Trust’s inception in 1995. HET is a division of the Council of Ethical Organizations (a non-profit, non-partisan organization committed to promoting ethical and legal conduct in private organizations, government, and the professions). The goal of the Trust’s CCP healthcare compliance certification program is to promote professionalism and competence throughout the health care compliance community. The certification process in overseen by HET’s Education Committee, which is an independent, voluntary committee of experienced compliance professionals from around the country. Members of this committee oversee changes to the certification process as well as reviewing applications for HET certification. Compliance professionals who wish to complete the CCP certification process must complete all requirements within the following four categories within a three-year period to qualify. To apply for the CCP credential, email a completed application to DirectorOfPrograms@corporateethics.com, or mail one copy your completed application and supporting documentation to: Health Ethics Trust, ATTN: Certification, 1727 King Street, Suite 300, Alexandria, VA 22314. Are you getting the recognition you deserve for your compliance expertise? Distinguish yourself through the Health Ethics Trust’s Certified Compliance Professional (CCP) Program! The CCP healthcare compliance certification program defines a level of accomplishment in the compliance profession and recognizes expertise in healthcare compliance. Certification recognizes compliance achievement at a professional level and establishes professional practice standards. CCP certification is a designation sought by individuals who strive to represent high professional standards in executing their compliance responsibilities. Complete the application and begin today to pursue your certification and be recognized as a compliance professional! CCP is a healthcare compliance certification process for a healthcare compliance professional that is offered by the Health Ethics Trust. The Trust began the process of establishing a professional healthcare compliance certification shortly after the Trust’s inception in 1995. The goal of HET’s certification program is to promote professionalism and competence throughout the health care compliance community. HET is a division of the Council of Ethical Organizations (a non-profit, non-partisan organization committed to promoting ethical and legal conduct in private organizations, government, and the professions). The purpose of the Trust is to promote sharing of information and the establishment of best practices in health care compliance and ethics. Why choose to be a HET Certified Compliance Professional? Compliance responsibilities continue to grow more complex, more regulated and more costly. New, more rigorous benchmarks for effective programs are demanded. The HET healthcare compliance certification process is very comprehensive. The Trust believes this approach is necessary because the compliance professional role is a complex, dynamic and challenging one. This is particularly the case for compliance professionals working in the current healthcare environment of increasing regulatory and enforcement pressures. The HET healthcare compliance certification process is periodically reviewed and updated to ensure its continued relevance to healthcare compliance professionals. Who oversees HET certification for compliance professionals? The Trust’s CCP healthcare compliance certification process in overseen by the Education Committee of the Council of Ethical Organizations. This is an independent, objective and voluntary committee of experienced compliance professionals (health care and non-health care) from around the country. Members of this committee oversee changes to HET healthcare compliance certification criteria as well as reviewing individual applications for HET certification. Members of the Council staff only serve in an administrative and advisory capacity to the Education Committee. This means that they do not have any decision-making authority regarding HET healthcare compliance certification applications. Council staff can, however, offer advice on how to best prepare for HET certification. In order to earn the CCP healthcare compliance certification, an individual must complete compliance related courses, have worked one year in a compliance position, and be recommended for certification by your supervisor. The application for the CCP healthcare compliance certification is built around specific factors. These factors include professional experience; higher education background and related continuing education. All items submitted for review with the exception of higher education must have been accomplished in the last four years. Requirement: A total of 100 points is required in the identified categories to qualify for the CCP healthcare compliance certification. The points are listed at the top of each section indicate the minimum/maximum points a candidate must have in each category. An applicant must have the minimum number of points in each category in addition to a total of at least 100 points. Current or recent (one-year minimum) workplace-based experience in a compliance-and/or ethics-related area. This includes experience where the applicant undertakes compliance and/or ethics work as part of their duties, but does not necessarily have primary responsibility for this area (e.g., an individual serving as a compliance director, compliance-training specialist or investigator under the supervision of the chief compliance officer). Is there a test for Certification? Applications for CCP healthcare compliance certification are reviewed by members of the Education Committee of the Council of Ethical Organizations. Responsibility for reviewing applications rotates among members of the Committee. Each application is reviewed by no fewer than three members of the Committee. All applications are reviewed with recognition of the wide range of backgrounds represented among current graduates, while maintaining the Trust’s goal of advancing the competence and reputation of healthcare compliance professionals. Committee members judge applications strictly according to the certification criteria – as described herein. What are the requirements for maintaining certification? The CCP certificate of achievement is valid for three years. It can be kept current by completion of 40 continuing education points submitted to the Council of Ethical Organizations within each additional three-year period. I’ve attended an HET course. How can I check the status of my course work? Please contact the Certification Coordinator at 703-683-7916 to request an update of your current certification status or for a list of current HET courses attended. What will successful applicants receive? Compliance professionals who wish to complete the certification process must earn a total of 100 points in the identified categories within a three year period to qualify. Applications for HET certification are reviewed by members of the Education Committee of the Council of Ethical Organizations. Responsibility for reviewing applications rotates among members of the Committee. Each application is reviewed by no fewer than three members of the Committee. All applications are reviewed with recognition of the wide range of backgrounds represented among current graduates, while maintaining the Trust’s goal of advancing the competence and reputation of health care compliance professionals. Committee members judge applications strictly according to the certification criteria – as described here.